Moorhouse’s, the Lancashire-based independent brewer is to launch a bewitching special edition of it’s ‘Black Cat’ dark ale (3.4%), a former winner of the coveted CAMRA Champion Beer of Britain. Primarily available as a 4.6% cask beer, there will also be a 7% version with limited cask availability – the latter will also be available in bottles, to be sold exclusively by the Booths supermarket group. 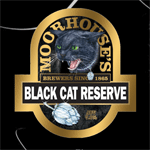 Moorhouse’s describe the beer as “An intensely dark beer, Black Cat Reserve conjures deep complex notes of roasted coffee chocolate and mocha, balanced by hints of dark cherry and blackcurrant from the Polish Junga hop’. The Burnley brewer’s link with Halloween is well established – largely due to their award-winning brews with names centred around the story of the witches of Pendle Hill (aka Pendle Witches) near Burnley in Lancashire; Black Cat reserve will join other themed beers including ‘Broomstick Bitter’, ‘Witchhunt’, ‘Black Witch’, ‘Witches Cauldron’, and ‘Witchfinder General’ – continuing the theme of their core beers ‘Blond Witch’, ‘Pendle Witches Brew’ and of course ‘Black Cat’. 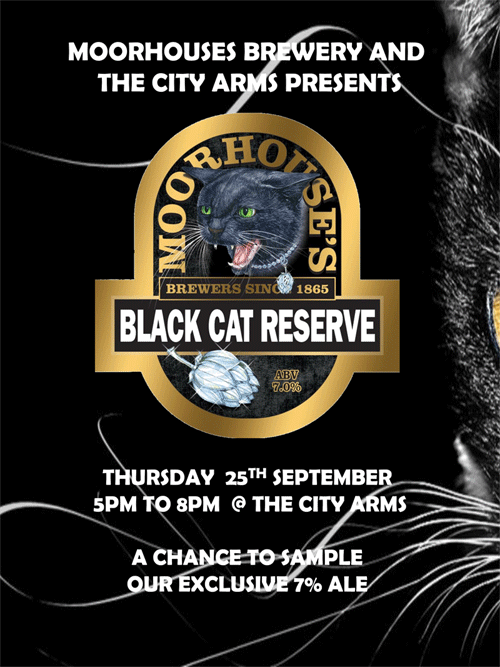 Moorhouse’s will be holding a number of roadshow events, providing the opportunity to sample the stronger variant, one of these being at the City Arms, Kennedy Street, Manchester on 25th September 2014. The brewery will be holding a Halloween Beer Festival on the 1st and 2nd of October, featuring Black Cat Reserve and 20 other cask ales – Halloween itself (31/10) will be marked by holding a fancy dress party on-site in their hospitality rooms.